1st Annual Tour de Hives!!! Varroa Mites: Vampires or Werewolves? Watch this 3-minute video to see how the Varroa Destructor is harming our honey bees! Catch the Buzz on September 20th 2014 as we celebrate NATIONAL HONEY MONTH! Get Ready Austin! This is your chance to show off your BEE-u-tiful BEE YARDS and your BEE FRIENDLY landscapes! This is an opportunity to celebrate the amazing honeybee with Austin’s 2nd Tour de Hives! You will visit with beekeepers in their own busy backyards to see what all the BUZZ is about! • Learn about the important role the bee plays in our delicate ecosystem. • Compare different types of hives. • Learn all sorts of interesting bee facts as you tour through the bee yards. • See how a colony works together in an observation hive. • Tempt your taste buds during the honey tasting! • Hear about the basics of beekeeping as a hobby. • Enjoy giveaways, prizes and more! It’s a unique opportunity for the whole family to enjoy! Bee Friendly Austin has partnered with several other companies to bring the Tour de Hives to Austin! 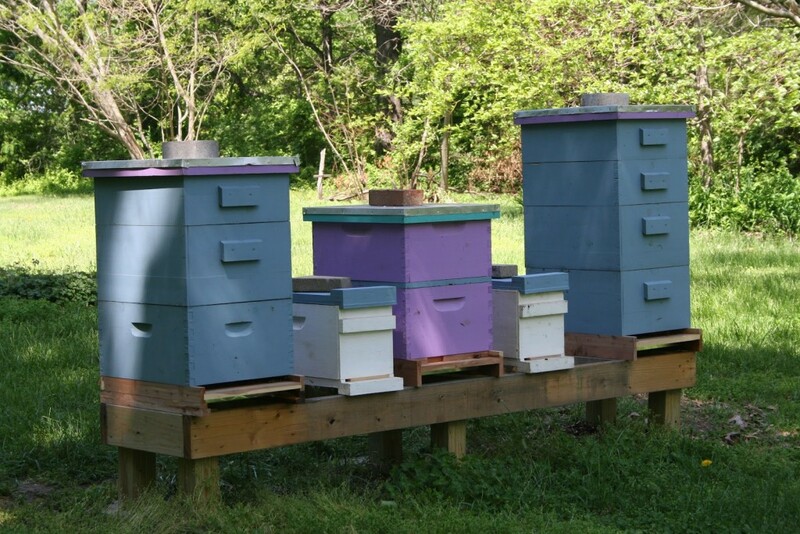 Apply now to include your bee yard in the tour program! Details at the Tour De Hives Website! Proceeds will benefit: Bee Friendly Foundation, Inc. … Saving the world, one bee at a time! Join us at the 13th Renewable Energy Roundup & Green Living Fair in Fredericksburg, TX September 27-29th. We will be at Booth #22 in the Covered Pavillion behind the Red Tent! Catch the BUZZ!!! Join us for the 1st Annual Austin Tour De Hives! The day’s festivities will kick off in Southwest Austin/Oak Hill at the Bee Friendly Austin Apiary. Ongoing event activities include: Honey tasting, mead tasting from Rohan Meadery, beehive tours, basic intro to beekeeping classes, raffle of a starter hive from Bee Weaver, beekeeping supplies for sale, and more! This will be a self-guided tour of bee yards in the Austin and surrounding areas. Discover how your neighbors are doing their part to save the planet one bee at a time! Bee yards will demonstrate a variety of ways to keep and attract bees showing all the creative ways you can indulge in the art of beekeeping! We currently have stops registered in Central Austin, North Austin, South Austin, Dripping Springs & Georgetown! You may visit each location in any order during the visiting hours listed on the map. Maps will be available on the day of the event at event headquarters in Southwest Austin. You will exchange your signed participant waiver for tour entry bands at your first stop. The tours will take place at people’s private homes or farms and it is sincerely hoped that everyone will exhibit common courtesy and respect as they visit each location. Guidelines for the tour are posted on the website. Official Sponsors: Bee Weaver Apiaries & Bee Friendly Austin, LTD. Proceeds from the event will benefit the Bee Friendly Foundation a Texas nonprofit dedicated to helping Texans become more bee friendly through educational opportunities, raising public awareness, promoting bee friendly landscaping and humane treatment of bees, grants for scientific research, and more! Have you heard the BUZZ at Trace Austin? https://www.facebook.com/events/522895974424151/ – BIG EVENT tonight at Trace Austin in the W HOTEL Downtown. What Happened to the Bees This Spring??? 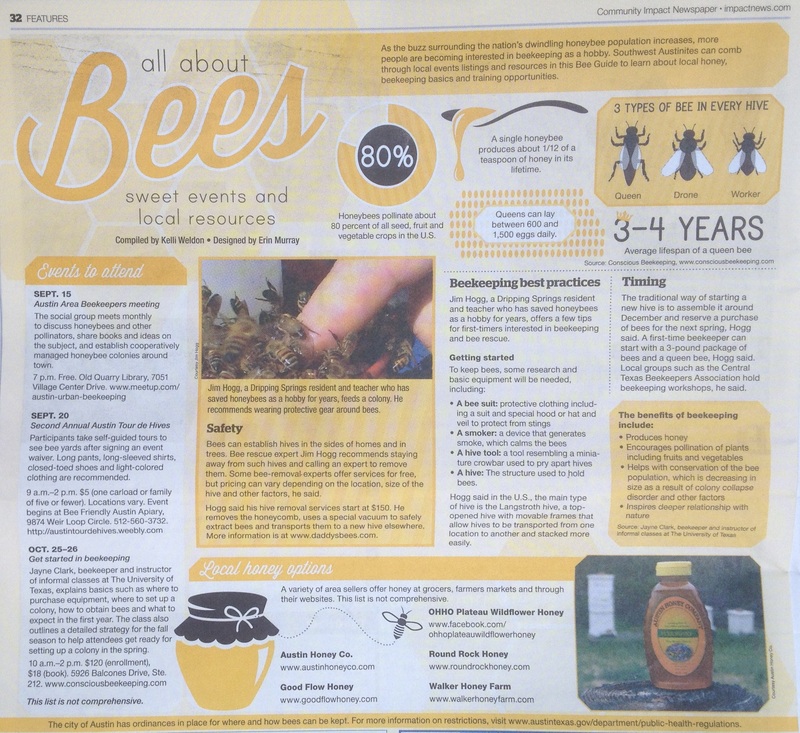 This is a pdf article on some of the possible issues that led to the decline in bee colonies in America Spring 2013.
millions of bee hives to fields each year just as crops flower. takes between 900,000 and 1 million honey bee colonies. ensuring that we’ll have blooms in our gardens. worth of raw honey was produced in 2002 in the United States. here to become essential parts of our agricultural system. foul brood and chalk brood are also taking a heavy toll. Beekeepers are battling these problems and not always winning. will kill them will also kill our essential honey bees. have to wear complete bee suits just to work their bees. medical attention. Fortunately, such massive stinging is rare. United States died from being struck by lightning. dangerous, as their venom is virtually identical. that has AHBs or not. often in areas thousands of miles from the nearest AHB. and the U.S. Virgin Islands—must be able to deal with them. And the public needs the best advice on how to live with AHBs. this and other bee problems.